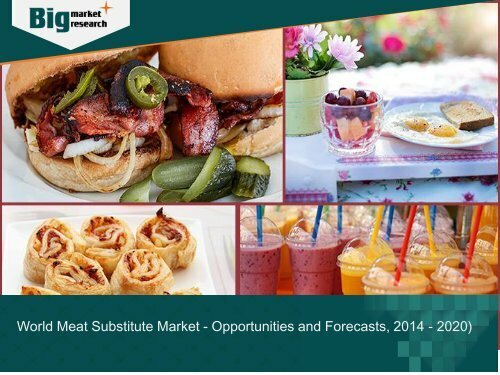 Big Market Research announces addition of report “World Meat Substitute Market - Opportunities and Forecasts, 2014 - 2020)” Report Available @ http://www.bigmarketresearch.com/meat-substitute-market Meat is an excellent source of protein but contains high level of cholesterol and saturated fats. Individuals who consume it on a regular basis are more prone to develop health problems such as obesity and atherosclerosis. Meat substitutes are products that resemble actual meat in terms of taste, flavor, and appearance, but are healthier as compared to meat. Such products are increasingly being used as substitutes for regular meat and meat products. They are primarily composed of ingredients such as soy, wheat, and others. Tofu is amongst the most popular meat substitute and is widely used as an alternative for pork, chicken, beef, and other meats. Europe and North America are amongst the biggest markets of meat substitutes; however Asia-Pacific is the fastest growing market.